When Duterte said Filipinos aren’t inherently good in math, I think he was referring to Rappler's employees. 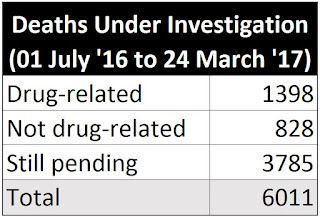 In September 2016, Rappler published Michael Bueza’s “IN NUMBERS: The Philippines' 'war on drugs’”, which supposedly serves as a tally of the deaths resulting from President Rody Duterte’s War on Drugs. Bueza has updated the list 75 times since September 2016, with the latest version (the 75th update) dated 07 April 2017. On the 75th update, Bueza, citing “revised PNP data”, came up with a total of 7,080 casualties by combining 2,555; 3,603; and 922, which are the deaths from police operations, DUIs, and concluded investigations, respectively. Rappler’s tally has so far been used by various international news agencies as the basis for the death toll of Duterte’s War on Drugs. It has been quoted by major organizations such as the [Financial Times, [Newsweek, the [Guardian, and even the [New York Times, and it has also been used as the basis for a [Human Rights Watch] report and a [European Parliament] resolution. 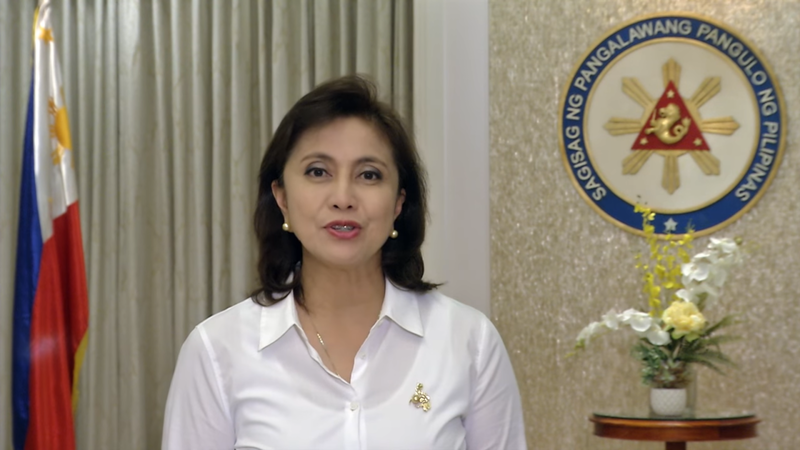 And most importantly, Vice-president Leni Robredo herself used this figure in a video address shown in a UN Commission on Narcotic Drugs side event, the same video that was featured on [Time] Magazine last month. Is 7080 deaths an accurate body count? And herein lies the problem: it appears to be a classic case not only of bad Math, but also of bad terminology. The Rappler article did not provide any precise definition of any of the equation’s variables, and that’s something that me, who is darned good in High School Math, find problematic. Moreover, I do not understand how Rappler categorized all DUIs as drug-related. How would they know they’re all drug-related if an investigation is still ongoing in the first place? And lastly, everyone suddenly use Bueza’s 7000 figure to describe the number of extrajudicial killings and summary executions, despite the fact that at least some of those killings must have been conducted in legitimate police operations. This is just messed up! How many were lawfully killed during police operations? Did the PNP say all DUIs are drug-related? How many DUIs have been confirmed as drug-related? How many drug-related deaths are there in total? In Rappler’s case, Bueza's formula is not only problematic, but also oversimplified. The rest of mainstream media had almost a year to clear things up, but they appear to enjoy a willful ignorance on the matter. Some influential organizations have already called for economic sanctions against the Philippines, yet local mainstream media insists on displaying an appalling level of negligence reminiscent of the Malacañang Press Corps’ legendary indolence. So why don’t I, ThinkingPinoy, sort it out myself? Senator Alan Peter Cayetano was right when he cited former President Benigno Aquino III’s Administrative Order 35 to show the problematic definition of “extra-judicial killings“ [Star]. An extrajudicial killing is the drug-related killing of a person by governmental authorities without the sanction of any judicial proceeding or legal process. An "extrajudicial killing or summary execution" shall be defined as the drug-related killing of a person by governmental authorities without the sanction of any judicial proceeding or legal process, or by civilians with the explicit approval of the State. “Drug-related killings” shall be defined as homicides where the suspect, the victim, or the suspect’s motive has a history of, or is connected to, illegal drugs. This shall be the the definition used for the rest of this article. Let’s get the numbers, shall we? Instead of speculating, I decided to go to Camp Crame and ask the Public Information Office of the Philippine National Police (PNP-PIO) about it. A couple of days ago, I visited PNP-PIO and interviewed Police S/Supt. Dionardo “Caloy” Carlos, the PNP‘s official spokesperson. The media reports over 7,000 extrajudicial killings and/or summary executions, that’s their description, but we only have 6,011 homicide cases recorded from 01 July 2016 to 24 March 2017. These (homicide cases are) formerly (called) DUIs, or deaths under investigation. 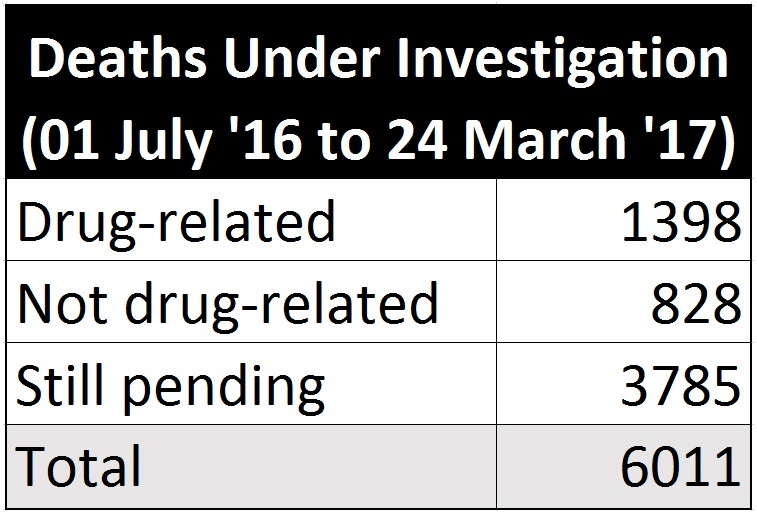 So, all killings that occurred while we're implementing the campaign vs drugs are classified as Deaths Under Investigation. but we don't necessarily say they're all drug-related, that's why they're under investigation. Yes. Now, we are determining which ones are really connected to the anti-drug campaign and which ones are regular crimes. Among these 6,011 homicides, we have determined that there are only 1,398 cases that are drug-related, so it’s automatically wrong to say that there have been over 7,000 EJKs or summary executions that they attribute to the campaign versus illegal drugs… There are names of victims, suspects, places, and not just numerical data. Carlos said there are 1,398 confirmed drug-related homicides, but these killings have yet to be proven to be state-sanctioned. Aside from the 1398 (confirmed drug-related deaths), we also have 828 resolved cases but the motives are different, not connected to illegal drugs... (The motives are) fights over parcels of land, personal grudges, atrocities of armed leftists, love triangles, (etc.) ... We still have (around) 3700 cases that are still under investigation. Subtracting 1,398 drug-related and 828 non-drug-related deaths from the 6,011 DUIs yields 3,785 DUIs with pending investigations. Over 7,000 killed in Drug War? In line with our definition of EJKs and summary executions, the oft-repeated statement “over 7,000 EJKs and summary executions in Duterte’s Drug War”, which would have included all 6,011 DUIs per Bueza’s formula, is incorrect. First, the 828 deaths that are not related to drugs are obviously not part of the War on Drugs. Second, the 1398 drug-related deaths may be EJKs or summary executions, but it is still unclear if the killings were state-sanctioned. Third, the remaining 3,785 DUIs are still being investigated upon, so it is still unknown if they’re related to drugs or not. Thus, how can we say that these 6,011 are EJKs or summary executions when the essential elements of such a crime have yet to be proven? In short, Rappler’s article that features Bueza’s calculations provide, at best, an upper limit of potential EJKs and summary executions, and not the actual number of EJKs and summary executions. I am technically correct when I say, “I have, at most, a million fingers” is technically correct because I have ten fingers and ten is less than one million. But is that statement meaningful? Does it help others get a better idea of how many fingers I have? Rappler did the same thing. Rappler basically showed that there are, at most, 7,080 extrajudicial killings and summary executions, even if the actual number of proven extrajudicial killings, so far is a lot, lot lower. How many EJKs and summary killings in the Philippines so far? Less than or equal to two. So far, there are only two clear candidates of EJKs and summary executions: that of Korean national Jee Ick-Joo and that of Mayor Rolando Espinosa. According to Carlos, Jee Ick-Joo’s murder was found out to be a classic robbery-extortion case that’s unrelated to drugs, with the culprits using the War on Drugs only as a camouflage. Again: Jee Ick-Joo’s murder is not part of the War on Drugs. Meanwhile, warrants of arrest have been issued for the suspects in Espinosa’s murder [Star], and the 19 suspects – all of them policemen – have surrendered [Star]. Their cases are still being heard in the local courts so under the presumption of innocence, they are still considered innocent until proven guilty. Does one clear case of EJK or summary execution warrant the international outrage against the Philippine Government today? Does it warrant the imposition of economic sanctions that can destroy millions of Filipino lives? Why did Rappler say that the PNP gave a 7,080 EJK or summary execution body count even if the PNP clearly didn’t do so? When we saw it after the first three months of the Duterte Administration, we wrote to Rappler so they can correct it… They did nothing. Carlos said Rappler’s news desk did not just ignore PNP’s letter, it even had the temerity to update that badly written article SEVENTY-FIVE TIMES. We saw that the Rappler article shows different figures, and they claim the data comes from the PNP. (We avoid incidents like these) that’s why we have an analysis portion every time we release information, so you can’t just make up an interpretation of the numbers given. So Rappler didn’t… we didn’t receive a reply pertaining to (the September 2016 letter). Carlos was referring to regular updates given to journalists covering the Camp Crame Beat. Camp Crame is the central headquarters of the Philippine National Police. How can they say differently when clearly, every time that I release the data, we put something like that (a note) there? It's more like questioning and playing with the use of words. They interpret it differently (from) the intention of the one that crafted the policy. According to Carlos, 2,694 deaths resulted from legitimate police operations as of 05 April 2017, but they can neither be counted as extrajudicial killings nor summary executions because they were committed in the course of legitimate law enforcement operations. Shoot only when life is in danger or a vicious felon cannot be apprehended. In case of an escaping felon, shoot as a last resort and when all means of apprehension have failed. In case of a firearm assault against the police, always shoot to kill. Now, critics of Duterte’s War on Drugs may argue that some of the 2,694 deaths must be extrajudicial killings or summary executions. However, the legal principle of presumption of regularity applies. Presumption of regularity is a principle applied in evidentiary evaluation that transactions made in the normal course of business are assumed to have been conducted in the usual manner unless there is evidence to prove otherwise [US Legal]. That is, this globally-recognized legal principle implies that the 2,694 deaths are justifiable homicides, unless the critics manage to prove otherwise. The problem, however, is that these critics never even attempted to file a single case against any policeman. The judiciary has shown a history of openly defying the Chief Executive [TP: Duterte vs Sereno], so these critics cannot claim unwillingness of the courts to hear these cases. In the absence of evidence showing abuse of authority on the PNP’s part, all these 2,694 deaths, except possibly for the death of Mayor Rolando Espinosa, are considered lawful. So how many EJKs or summary executions are there? One, at most, so far. Despite the lack of evidence, relying solely on Duterte’s fiery rhetoric, and without fully consulting the PNP, the opposition, led by vice-president Leni Robredo, propagated the grossly inaccurate death toll figure that “genius” Rappler employee Michael Bueza “computed”. Michael Bueza, the same “genius” who not-so-subtly insinuated that Bilibid inmates could not have contributed to Senator Leila de Lima’s campaign because they’re not on the contributor list. None of the contributors to the senator's 2016 campaign have been mentioned by the witnesses in the congressional inquiries on the reported drug trade inside Bilibid [Rappler]. Bueza is seriously a piece of work, along with his overlords Maria Ressa, Glenda Gloria, and Chay Hofileña, who allowed the publication of the article and its SEVENTY-FIVE updates. This is the problem when a local news outfit is funded by foreigners. They need not care about customer feedback, because no matter how much they hemorrhage money, they still got lots in store. Screw accountability, screw dismal social media performance: all Rappler needs is good Search Engine Optimization and it can spread its fake news far and wide [TP: SPO4 Pia]. What's more worrisome is that NOBODY in mainstream media, except for the Manila Times, bothered to investigate this journalistic monstrosity.